In February 2015, President Obama hosted a three-day summit on “Countering Violent Extremism” (CVE) that featured a roll-out of three local programs in Boston, Minneapolis, and Los Angeles. This culminated CVE efforts by the Obama administration going back to 2011. But just over a year from Obama’s White House Summit on Countering Violent Extremism, the programs are now admittedly a complete failure — and publicly rejected by elements of the very communities they intend to serve. Even at the time of the summit, the CVE programs had already been deemed a failure. These programs are also a practical failure in preventing violent extremism. Earlier this month, the Associated Press reported on one Somali youth leader in Minneapolis associated with government-funded CVE programs who laterattempted to join the Islamic State. Remarkably, as the Obama CVE programs are in complete meltdown, Republican leaders such as Rep. Mike McCaul, chairman of the House Homeland Security Committee, and conservative organizations such as the Heritage Foundation are openly embracing Obama’s CVE agenda — and even calling for its expansion. So Obama’s own stated goals fall into three areas: 1) engagement; 2) training; and 3) counter-propaganda. In each of these areas, Obama’s CVE programs have been a complete failure. 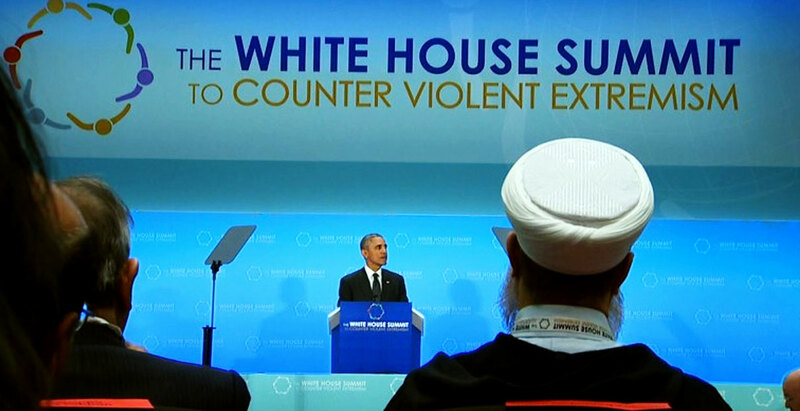 Obama’s CVE policies were developed in 2011 specifically at the demand of U.S. Muslim groups. Now, the very same Islamic groups that demanded CVE are some of its loudest opponents. They claim that the administration is promoting “Islamophobia” through their programs. Shannon Erwin, cofounder of the Muslim Justice League, said the program could rely on false indicators to identify potential at-risk youths, targeting people who grow beards, express interest in foreign policy, and adhere to strict religious beliefs. A diverse group of leaders representing civil rights and religious organizations Tuesday called on Minnesotans to stand against Islamophobia and oppose a federal anti-terror program.The leaders, who met at the State Office Building for an event organized by the local chapter of the Council on American-Islamic Relations, said they are concerned about recent anti-Muslim comments from presidential candidates and the “negative impact” that the federal government’s Countering Violence Extremism program might have on the Muslim community. These engagement efforts targeting communities vulnerable to terrorist recruitment have been such a failure that National Public Radio had to recently report that even if the CVE programs aren’t effective, they somehow mystically still benefit these communities. One of the first federal agencies to openly embrace the White House CVE initiative was the Defense Department. 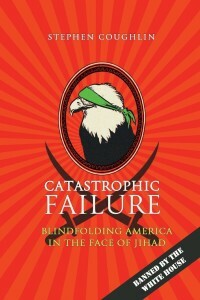 But at the time, some warned that the administration’s “purge” targeting both counter-terrorism training and instructors was based on highly partisan reporting, and that the DOD’s efforts would lead to a blinding of the foremost elements of the U.S. government conducting the War on Terror. Unable to define the enemy, the U.S. would wander aimlessly, fighting an unending war against an ever-shifting opponent. Those predictions of the Pentagon’s intentional blinding of its war-fighting units have proved catastrophically true. Having intentionally purged the DOD’s training of any ability to define the enemy, America’s top warriors admit they have lost any ability to identify, and then defeat, the enemy. On September 8, 2011, Obama signed Executive Order 13584, which led to the establishment of the State Department’s Center for Strategic Counterterrorism Communications (CSCC) to counter terrorist propaganda. But not even five years after the fact, the program has suffered chronic leadership changes and a string of public embarrassments in the face of the growing international terrorist threat from the Islamic State and other terrorist groups. As a consequence, the State Department has closed the CSCC in the face of widespread failure, and now the U.S. government must delegate these vital tasks to foreign organizations. Among the many embarrassing CSCC episodes was a graphic video they producedcalled “Welcome to ISIS Land” that featured severed heads, corpses, and crucifixions interspersed with messages directed at would-be ISIS recruits about the grisly skills they would need to acquire. The CSCC director — a longtime U.S. diplomat — was promptly replaced. Another CSCC effort was their “Think Again, Turn Away” program that pushed out counter-messaging via social media targeting potential ISIS recruits. 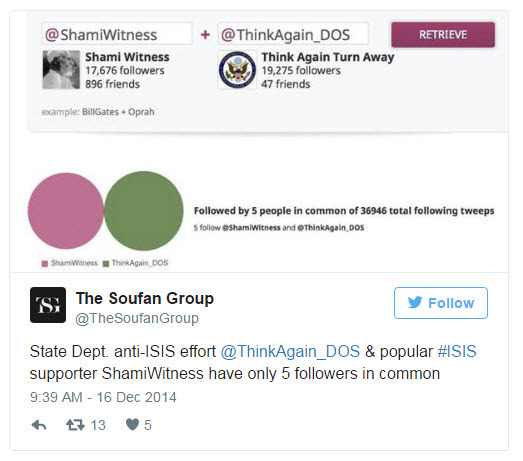 The program’s Twitter account would regularly “troll” ISIS adherents on Twitter. But not long after the program was launched terrorism experts were openly lambasting the program, including accusations that the CSCC’s efforts were legitimizing terrorists. In the comments to that tweet, some users revealed that they were among the five followers that overlapped — and they weren’t even recruiting targets, but terrorism researchers or academics. In February 2015, Obama’s envoy to the Muslim world, Rashad Hussain, wasappointed to lead the CSCC. Yet by year’s end, a State Department panel of expertsconcluded that the CSCC’s efforts were not effective, and questioned whether the U.S. government should be involved in counter-propaganda at all. Rashad Hussain was promptly moved to the Justice Department and the CSCC shut down. In January 2016, a new effort, the Center for Global Engagement, was launched, but with little prospect that rebranding their efforts will be more effective. So the Obama administration’s counter-propaganda efforts were not only unsuccessful, but found to be so harmful and counter-productive that they had to be shut down and replaced. Now, most of the U.S. government’s counter-propaganda efforts have beenoutsourced to the Sawab Center in Abu Dhabi, and the continued in-country counter-propaganda efforts of the Obama administration now have to be characterized as “ninja” because they are so unseen (and unmeasurable). By the three key areas of activity established by the December 2011 White House Strategic Implementation Plan — namely community engagement, counter-terrorism training, and counter-propaganda — all of the CVE efforts have been at best ineffective, and at worst an aid to the enemy. Meanwhile, reports about the dismal performance of their local CVE programsannounced at the White House Summit in February 2015 continue to emerge. The whole CVE industry of government, academics, and community groups has devolved into farce, as I noted here at PJ Media recently following the “CVE Summit” held in Washington, D.C. This has transpired as the domestic and global terror threat continues to grow. The Obama administration demonstrates time and again that it is not up to the task of protecting Americans from those threats. Solutions to these problems are undoubtedly out there, but they will continue to be crowded-out and dismissed by the “experts” as long as the absurdity of CVE continues.